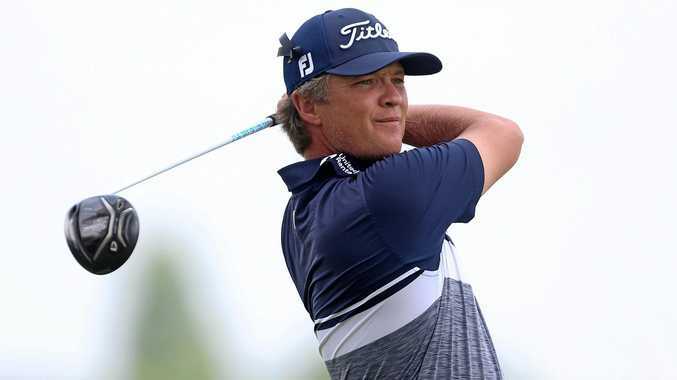 AUSTRALIA'S Matt Jones has carded an eight-under 63 to move to within five shots of leader Michael Kim, who is yet to finish his second round of the weather-affected John Deere Classic. Winless in 84 career PGA Tour starts, Kim was 16 under through 17 holes of his second round. Jones had six birdies and an eagle three on the par-five second to jump 32 places and into a tie for fifth. Kim birdied eight of his first 14 holes to race past first-round leader Steve Wheatcroft, who shot 68. Wheatcroft was on 12 under along with Canadian David Hearn (64) and Johnson Wagner (66). Jones, Italian Francesco Molinari (66) and Bronson Burgoon (15 holes) are all on 11 under. Veteran Australian Stuart Appleby's 70 left him at five under and compatriot John Senden signed for a five-under 66 to be at four under. Local favorite Zach Johnson, who won at the Quad Cities in 2012 and has seven top-five finishes at TPC Deere Run, shot a 70 to move to three under, just inside the projected cut line. Australia's Steven Bowditch, who is using a rookie caddie he found via Twitter this week, shot a 72 to be at three over and will have the weekend off along with fellow Aussies Cameron Percy, Aaron Baddeley and Robert Allenby. The second round was delayed by nearly an hour because of poor weather. It was resumed and then called because of another batch of storms that descended on the area.